Designer and colorful entrepreneur Laura Angotti established Rowdy Sprout in 2003. Like many great stamps in the history of success, Rowdy Sprout began as a "side project" while Laura achieved her graduate degree in costume design. At the time she became inspired by a children's shop that was owned by one of her good friends in New York City. With her carefree and fun-loving attitude for walking a different path, Laura knew that she had to do something extraordinary. Deciding to flip the coin from previous triumphs in museum installations, Laura officially graced the children's fashion industry and took root with innovative and fresh concepts. 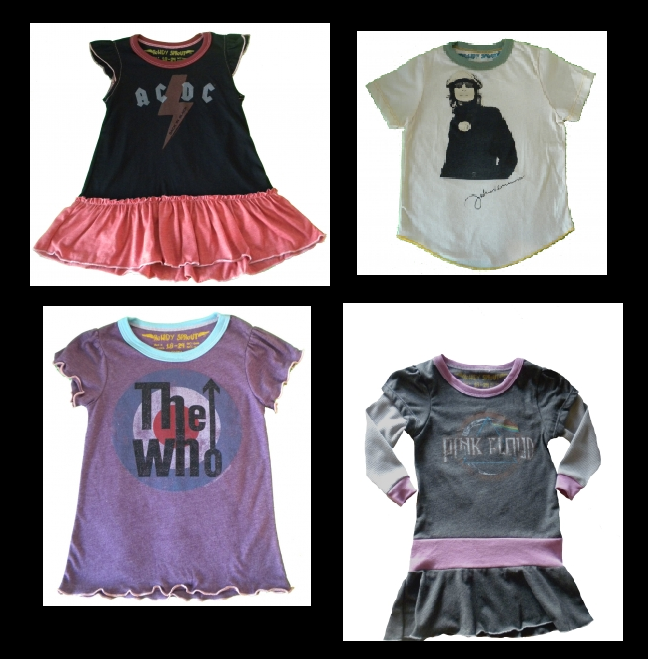 Over the recent years, Laura has brought nostalgia to parents abound by offering classic rocker tees to the little ones of our world. She has personally and prudently hand selected the bands and designs currently available in the Rowdy Sprout product line. These hip and funky styles are offered to children anywhere from recently sprouted (3 months) to wordy back talkers (8 years)! Every shirt created has Laura's utmost approval of quality and practicality while being manufactured and silk-screened by local Los Angeles companies. Each garment is intricately woven with the finest softest blends available and is made in the USA without the use of sweatshops. It is a given that these shirts can be rocked out many a time between each little stage diver and pre-Jagger. Rowdy Sprout can be found in over 600 boutiques nationwide and has extended to International buyers including Dublin, Paris, and Barcelona. The company has even found admiration by extensive celebrity clientele including Angelina Jolie and Julia Roberts. Each band represented has been properly licensed and will enjoy the benefit of royalties for each garment sold. Most importantly, Laura Angotti has poured her heart and soul into Rowdy Sprout insuring that the love for her product is continually enjoyed by the juniors of our generation. One of my fondest memories from when I was younger is of when my brother first introduced me to "The Beatles". After listening to just a few songs......I had found what till this day, is one of my absolute favorite bands! Trying to instill some passion for the musical "greats" in my kiddo's, The Beatles have been on a frequently heard play list in our home since they were very little.....and have now also become one of their favorites. So, whats the next step for a young fan? Display some pride for the band of course! 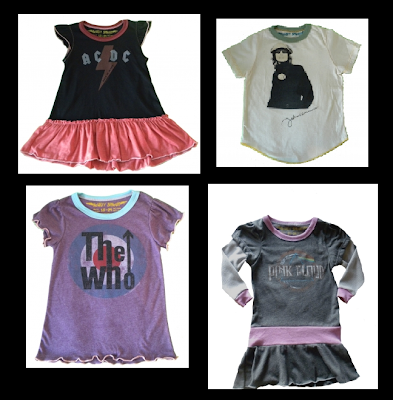 What better way than with the adorable rockin' designs from Rowdy Sprout! Rowdy Sprout offers a wonderful collection of Rocker-Tees and Apparel which displays band members (check out the John Lennon Tee Pictured Above) and logo's from some amazing bands that have rocked the worlds of generations past and present! 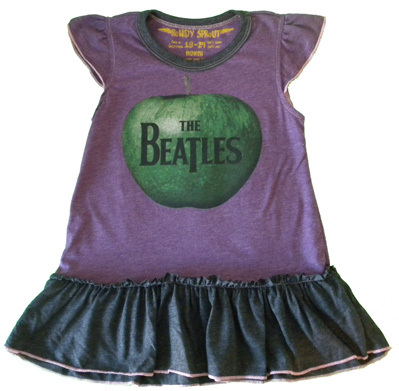 The princess received the Beatles Apple Dress (pictured above). Perfect for every rocker princess, the dress displays The Beatles Apple Records logo while remaining adorably girly with a ruffle bottom and ruffle sleeves. The Beatles Apple dress allows the princess to maintain her rocker princess status while remaining comfortable in this super soft design. The princess is delighted with her new dress.....and I couldn't be more proud having taught both of my little one's about some of the greatest music legends that have ever graced the stage! You can find the Beatles Apple Dress along with other adorable rockin' designs at http://www.rowdysprout.com/ . New follower here. I saw your comment on MBC and decided to come check out your site and it's awesome! Please come visit Random Deals when you get a chance. Thanks.